I absolutely love cheesecake. The crumbly digestive base combines with the smooth, creamy soft cheese topping so well. Even on its own its fantastic, but add a layer of berries, fruit, chocolate or even After Eights on top and it becomes something magical. The only cheesecakes I tried before this were the no-bake kind. During a fair quite a few months ago, I tasted a traditional Canarian baked cheesecake with blueberries and it was amazing. 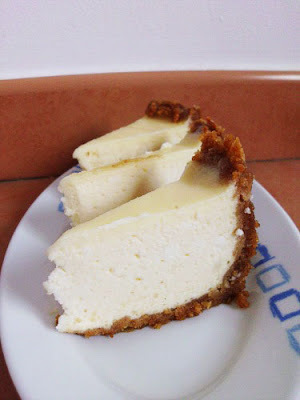 It was that experience which inspired me to try a baked cheesecake – more specifically a New York cheesecake from Joyofbaking. This recipe made around 20 small portions which are perfect for wrapping in cling film and freezing. 1. Grease a loose-bottomed cake tin and preheat the oven to 170C. 2. Mix the Digestive crumbs, sugar and melted butter in a bowl. Press evenly into the bottom and up the sides of the cake tin. Cover and refrigerate whilst making the filling. 3. Combine the cream cheese, sugar and flour in a medium bowl. Do not over-mix as this will cause your cheesecake to crack. Add the eggs one at a time, mixing well after each. At the cream and vanilla and mix gently. Remove the cake tin from the fridge and pour in the filling. 4. 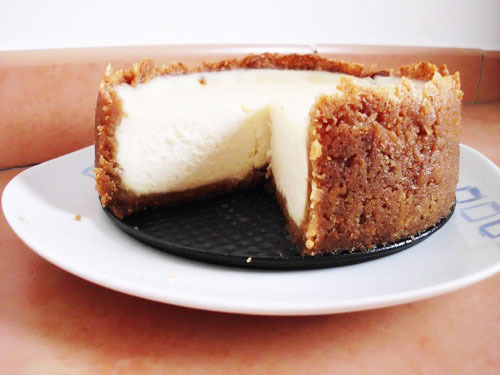 Bake the cheesecake in the centre of the oven for 15 minutes, before reducing the temperature to 120C. Continue to bake in the cooler oven for around 60 minutes, or until firm and only the centre appears to be wet and wobbly. Remove from the oven and place on a wire rack. 5. In another bowl, combine the sour cream, sugar and vanilla. Spread the topping over the warm cheesecake and return to the oven to bake for a final 15 minutes. Remove from the oven and run a knife around the edge to loosen the cheesecake. This step also prevents the surface from cracking. 6. Let cool completely before covering with cling film and placing in the freezer overnight. 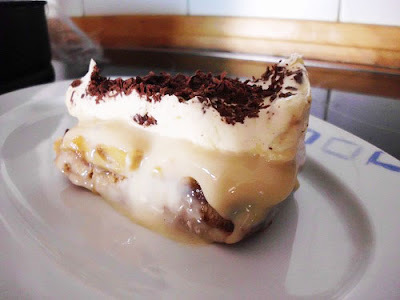 I don’t think I’ve ever tried a banoffee pie and been disappointed. They’re just so basic and easy to make that it’s really difficult to make one and have it turn out to be a disaster. 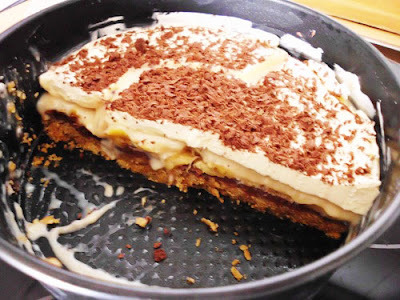 Digestive base, bananas, toffee and cream – that really is all there is to it! This was the first time I’d attempted to make a banoffee pie and I was really pleased with the way it turned out. When my dad came to visit, I offered him some and afterwards he said “I didn’t think I would like this but I suppose it was okay” which is about as much of a positive reaction as I can get out of him! This recipe is really quick and easy to follow. The only parts which require a lot of time is the making of the toffee and the final chilling time – both of which require practically no effort. 1. Crush the digestives in a food processor for in a plastic bag with a rolling pin. Tip into a bowl and stir in the melted butter until combined. 2. Press the crumbs into the bottom of a lightly greased cake tin (mine was around 20cm) and chill in the fridge until the toffee is ready. 3. Place a bowl over a pan of simmering water and into it pour the condensed milk. Leave on the hob for around 2 hours, stirring now and again, or until the mixture is thick and toffee-coloured. Check the pan for water regularly and add more when necessary. 4. When the toffee is ready, remove the bowl and pan from the hob and leave to cool to room temperature. Take the cake tin out of the fridge and place to one side. Place the chopped bananas so that they line the crumbs. 5. Spoon the toffee mixture into the cake tin and spread evenly. Whip the double cream and spread it on top of the toffee mixture. Sprinkle the grated chocolate on top. It can easily be portioned up, wrapped in cling film and stored in the freezer for months. One of my favourite things about living in Tenerife is that there always seems to be a festival going on in some part of the island. From small fiestas with music and dancing, to huge carnivals with parades and concerts, the one thing that is always fantastic at these parties is the food. There was a small carnival in Los Cristianos a while ago and Boyfriend and I decided we had to go so we could have a ‘papa asada’ or jacket potato. 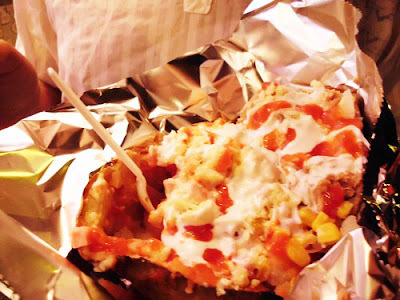 Now, the thought of a jacket potato probably doesn’t strike you as anything worth going out of your way for, but believe me, these are definitely worth the trip. Loaded with ham, tuna, cheese, olives, carrot, sweet corn, alioli and sweet chilli sauce, these jacket potatoes may not be much to look at, but they taste amazing. The setting definitely enhances the flavours and enjoyment to be had from these potatoes. Large families meander through the stalls, trying their hardest to keep track of their kids who are begging to go on some rides. The lights from the arcades and the amusements are reflected in everyone’s large eyes as they try and take in as much of the intoxicating atmosphere as they can. Typical Spanish music is pumped through the streets, as entertainers bustle amongst youths dancing in their attempt to reach the stage on time for their performance. Bought from the ‘Paponazo’ van for only €4, these potatoes are taken from a huge furnace which has completely charred the skin on the outside. The toppings are then piled high onto the potato, which gets stabbed with a plastic fork before being thrust in my hands. 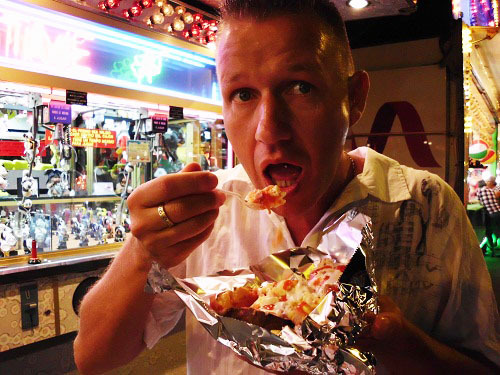 The first bite is akin to an assault on the senses – the taste buds are simply overwhelmed by the amount of flavours on the tongue. By the time the second bite has been had, I’m hooked and have to carry on until nothing but the blackened, ravaged skin and an empty foil basket and plastic fork are left. Have you ever visited the Canary Islands and decided you loved them so much that you’d like to move here? Then check out the Moving to Tenerife book I co-authored! It’s a detailed guide book full of everything you need to know about moving to Tenerife (and the Canaries in general) including how to get a job in Tenerife, how to become a resident in Tenerife and some basic Canarian phrases that will help you get by in everyday life. You can buy Moving to Tenerife on Kindle for only £4.99 from Amazon.co.uk. Don’t have a Kindle? No worries! You can also buy Moving to Tenerife in paperback for only £7.33 from Amazon.co.uk. 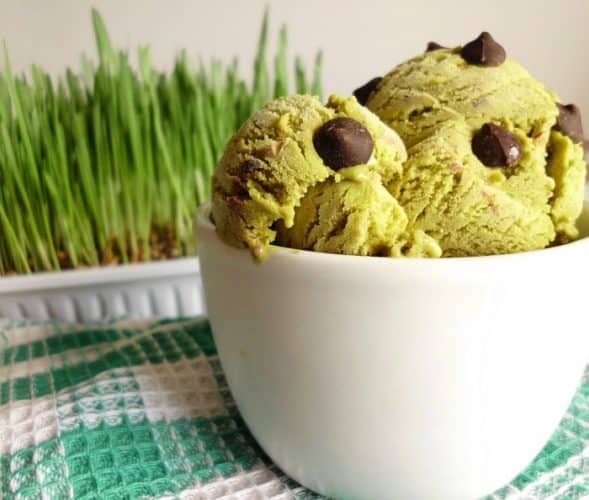 Why yes, that is a small tub of grass being used as a food blogging photo prop. I grow it for my guinea pigs and it was one of the few green things in the house that I thought I could just about get away with using as a prop. One of America’s most popular summertime treats, s’mores are no longer restricted to the BBQ. There are a vast number of new recipes circulating which incorporate s’mores – muffins, brownies, even cheesecakes! So I thought I would add my own recipe as a way to say goodbye to summer and welcome autumn. I remember first being introduced to s’mores – on my 15th birthday when a group of friends and I went camping. We were all sat around a fire on a beach as dusk was rolling in and a friend born in the US pulled biscuits, marshmallows and chocolate out of her bag. The result was magical. Boyfriend and I go camping all the time and authentic BBQ s’mores are one of the reasons I love it! Being without Graham crackers in Tenerife, I always substitute digestive biscuits, which seem to work just as well. There is something oh-so-satisfying about sitting next to a hot fire and biting into the warm crunchy biscuit, leaking gooey marshmallow and silky liquid chocolate all over your face and hands. 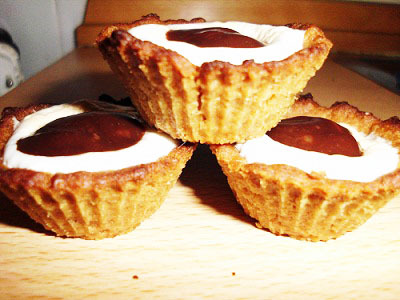 They may not look it in the photos, but these s’more cups are really tiny – about 4cm wide and 2cm tall. The recipe yields 12 this size, if you want to make larger ones, you’re going to have to double the ingredients or half the amount you wish to make. 1. Preheat the oven to 180C. Crush the digestives into fine crumbs – either by hand, in a bag with a rolling pin or in a food processor. 2. Melt the butter in the microwave or on the hob then mix with the digestive crumbs and icing sugar. Mix well. Press the mix into the bottom and sides of small muffin molds, creating cups. 3. Pop them into the oven for five minutes, until they just begin to puff up. Whilst the cups are in the oven, melt the chocolate in a bowl above a pan of simmering water with 1 tbsp of butter. At the same time, quarter each of the marshmallows with scissors. 4. Share half of the melted chocolate mixture between the cups and then place a quarter of a marshmallow on top of each one. Replace in the oven for 2 minutes, or until the marshmallows just begin to brown. 5. Remove from the oven and share the rest of the chocolate mixture between the cups, spooning a little on the top of each marshmallow. These can be stored in the fridge or at room temperature in a sealed container.